Here she was, in the midst of a multitude of people, a place the Law forbade her to be. Why? For twelve long years, she suffered with a condition, a hemorrhage of blood, one that the doctors could not cure. She spent all her money on their lack of knowledge. Many images suggest that the woman crawled in the dirt to touch Jesus’ hem, but if she had, she would have been trampled to death. I wanted to title this: She Did Not Crawl in the Dirt! You’ll see why in a second. God commanded the Israelites to make fringes or tassels on the corners of their garments that they would look upon them to remember all the commandments. The Hebrew word for fringe is tsiytsith or tzitzit. It also means a wing-like projection, a tassel, etc. Corners also means an edge, border, skirt, wing, etc. The hem on the tallit was/is not as we know hems today. It was/is not just the end of the fabric turned under and stitched in place. The Greek word for fringe is kraspedon, which is translated hem and also means tassel, border, edge, skirt, etc. There were/are strict rules for the construction of the knots and windings that made up (and still make up) the fringe. A tallit was/is treated with extreme respect; therefore, Jesus’ tallit would not have been dragging in the dirt. That would have been a disgrace. 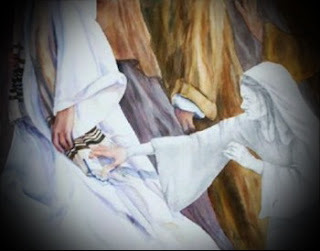 Trembling, the woman flung her hand out, grasping the hem/fringe of Jesus’ garment. Immediately, Jesus stopped in His tracks, halted by a release of His power from her grasp of faith. The healing in His wings, in His fringe? In the making of the tallit, there were/are 39 windings of the fringe. Jesus received 39 lashings of the Roman whip for our affliction, for our healing! Are you a part of the crowd, just brushing up against Him, or are you seeking Him in the midst of all that’s going on around you? Does your faith press into His presence for all you need? When health disintegrates, when money dissipates, when friends disappear, when the church and family disown you, what’s left? Your source of all the rest is Jesus and clinging to the fringe of His garment. Jesus still comes today, in your direction, within your reach. He is passing by you today. Will you merely bump into Him, hoping something rubs off Him and onto you? Or will you get close enough to reach out in faith to touch Him, to be made whole? Ask yourself: What will happen if I touch His hem?